Researchers have found a link between an increased risk of osteoporosis and sleep apnea. They published a study about it in the Endocrine Society's Journal of Clinical Endocrinology & Metabolism (JCEM). The study notes that sleep apnea deprives the body of oxygen, weakens bones, and raises the risk of osteoporosis. It also cites that women and older individuals with sleep apnea are most likely to experience weakening of bones. Sleep Apnea is a sleep related chronic condition where a person suffers shallow, obstructed or paused breathing during sleep. The duration of these pauses last from a few seconds to a few minutes, occurring five to more than thirty times in an hour. Osteoporosis is the most common type of bone disease with one out of five American women over the age of 50, suffering from it. It is a disease of the bones where the body's bone density is low which leads to an increased risk of bone fracture. It occurs when the body fails to form enough new bone, when too much old bone is reabsorbed by the body, or both. A diagnosis of obstructive sleep apnea may raise the risk of osteoporosis, particularly among women or older individuals, according to a new study published in the Endocrine Society's Journal of Clinical Endocrinology & Metabolism (JCEM). Sleep apnea is a condition that causes brief interruptions in breathing during sleep. 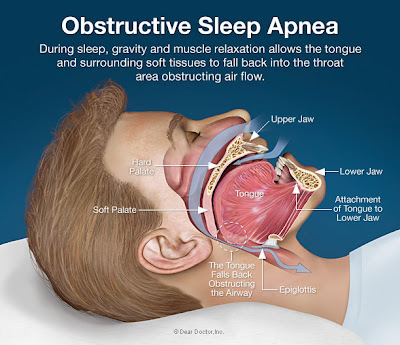 Obstructive sleep apnea, the most common form, occurs when a person's airway becomes blocked during sleep. If sleep apnea goes untreated, it can raise the risk for stroke, cardiovascular disease and heart attacks. "Ongoing sleep disruptions caused by obstructive sleep apnea can harm many of the body's systems, including the skeletal system," said one of the study's authors, Kai-Jen Tien, MD, of Chi Mei Medical Center in Tainan, Taiwan. "When sleep apnea periodically deprives the body of oxygen, it can weaken bones and raise the risk of osteoporosis. The progressive condition can lead to bone fractures, increased medical costs, reduced quality of life and even death." The retrospective cohort study used records from Taiwan's single-payer National Health Insurance program to track treatment of 1,377 people who were diagnosed with obstructive sleep apnea between 2000 and 2008. During the course of the next six years, researchers compared the rate of osteoporosis diagnosis in this group of obstructive sleep apnea patients to 20,655 people comparable in age and gender who did not have the sleep disorder. "As more and more people are diagnosed with obstructive sleep apnea worldwide, both patients and health care providers need to be aware of the heightened risk of developing other conditions," Tien said. "We need to pay more attention to the relationship between sleep apnea and bone health so we can identify strategies to prevent osteoporosis.